The Mortgage Calculation (Loan Amortization and Appreciation) software for Excel does all the usual things you'd expect from loan software and can accept up to 30 balloon payments. Use this Amortization Loan Software for real estate loans and mortgages, contract sales and notes, car loans, etc. The Appreciation Software is also included. The Appreciation Software is fully functional freeware. 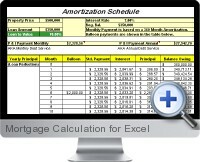 Mortgage Calculation for Excel can calculate loan payments and make payment schedules. The Appreciation Software is also included for no charge. Mortgage Calculation for Excel can be applied to real estate loans, house mortgages, contract sales, notes, bonds car loans, etc. Note: The Mortgage Calculation for Excel download version limits the max loan amount to $75,000 and allows 10 uses. If you want to go beyond these limits, please buy the registered version, which has no limitations.